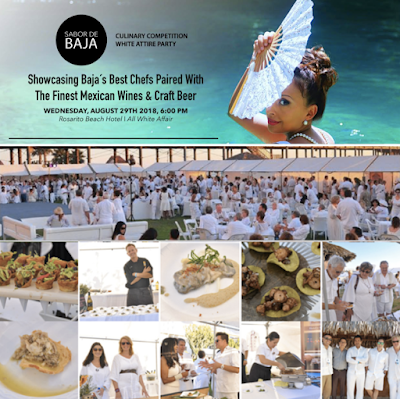 On Wednesday, August 29, diners dressed in white will converge on the ocean front gardens of Rosarito Beach Hotel for a Baja-style culinary celebration and competition. Organized by popular Rosarito dining destination Mi Casa Supper Club, Sabor de Baja is an annual “end of summer,” all-white-attire festival that always sells out well in advance and features a culinary competition among more than 20 of Baja’s top chefs, a tasting of a variety of Baja delicacies, live entertainment, and samples of an array of the finest Mexican wines and area craft beer in a most beautiful setting. The event includes the highest attendance of ex-pats in all of Baja and is one of our favorite parties of the year! The mission of the Sabor de Baja event is to promote gastronomy tourism between the U.S. and Baja and showcase the rich culinary culture of our neighbor to the south. Each attendee gets the opportunity to taste a pairing of participating chefs creations together with a wine or beer producers. There are two main awards given during the evening of Sabor De Baja - the first is decided by a panel of distinguished judges and the second is the "People's Choice," which is decided by popular voting from every attendee who submits a ballot. Tickets to Sabor de Baja are $85 for a Gold Ticket (which includes early entry at 5:30pm, reserved seating, all tasters and a commemorative wine glass) and $70 for a Silver Ticket (with entry at 6pm, access to all food & wine and a commemorative wine glass). There are also a variety of hotel and ticket package combinations available. Past participating restaurants have included Mi Casa Supper Club, Sylvestries, Tabule, Rosarito Beach Hotel, Casa Plasencia, Saverios, Alximia LaX, Pedreval Club de Polo, Planta Baja, Navío, Mixtura, Belio, Latitud 32, Fuego, Baron Belche (Talal), Pasta y Basta, Crillolo, La Concheria, Mantou, Koi Sushi and others. This year's attendees will be announced soon. Tickets can be arranged and purchased by contacting Sabordebaja@gmail.com. Act fast, because this event always sells out weeks in advance. Rosarito Beach Hotel is located about 45 minutes from downtown San Diego by car in what is a simple and beautiful drive. It's also a very inexpensive Uber ride from the border crossing, which is easily accessibly by trolley. For more information, visit sabordebaja.com and check out the video below for scenes from year's past.